What is it about rock? 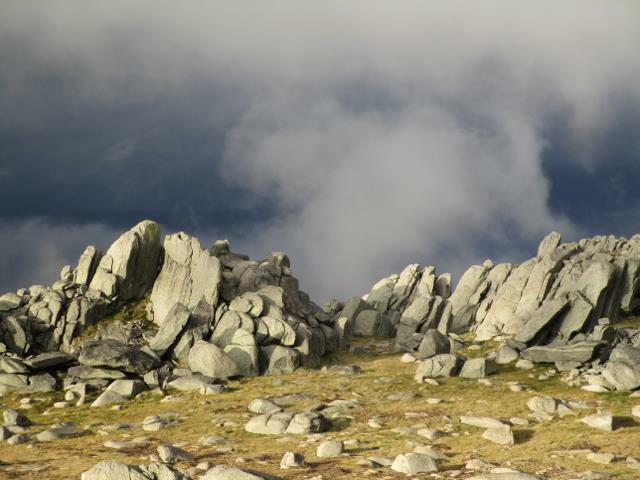 I am indebted to my bushwalking friend, Ross Norrie, for these magnificent photos. Both were taken on the “roof of Australia”, the Main Range of the Snowy Mountains where Mt. Kosciuszko is located. It is intriguing that we find such barren jumbles of rocks singularly attractive. The rocks in the photos are not part of universally loved “rocky” landscape features such as cliffs, canyons, mountain ridges and peaks. This means that they are not getting their appeal by way of association. No – Ross’ photos elicit an emotional and aesthetic response to rock as rock and not rock as part of anything else. What are we to make of this response? Is it telling us something important about rock, and indeed about ourselves? I hope I can convince you that it is. We know that rocks or stones have served symbolic and religious purposes from pre-historic times. In a great many of the world’s cultures, highly revered stones or stone monuments have spiritual or religious significance and form integral parts of what can be described as “sacred landscapes”. Generally speaking, sacred features in the landscape come into being when humans acknowledge some form of spiritual presence or property. Even before there is any awareness or acknowledgment of a place’s sacredness, simply being in the place can elicit quite powerful emotions including awe and fear. I can recall, for example, an experience of unexpectedly coming upon a group of large granite tors in a relatively remote bushland clearing and immediately feeling a mixture of excitement and awe. Before I could violate the place by taking photos, my companion identified the place as an Aboriginal sacred site – rightly as we later learned. Almost certainly, the behaviour we are talking about is universal – displayed by people regardless of geographic location, culture or historical time. While science has not demonstrated this directly, the indirect evidence is compelling, especially evidence from what we know about the human brain’s capacity to obtain and use sensory information from the natural environment. We humans possess visual prowess that is unsurpassed as far as detecting and making sense of patterns and shapes are concerned. Working together in bewilderingly complex ways, our eyes and brains help us to make sense of the world by enabling us to discover meaningful patterns with extraordinary efficiency, fidelity and flexibility. Our pattern-detecting ability is so developed that we are able to see meaningful images where objectively (or mathematically) there are none – in, for example, many naturally occurring random configurations such as clouds, cracks in the ground, the surface of the Moon and, yes, rocks. 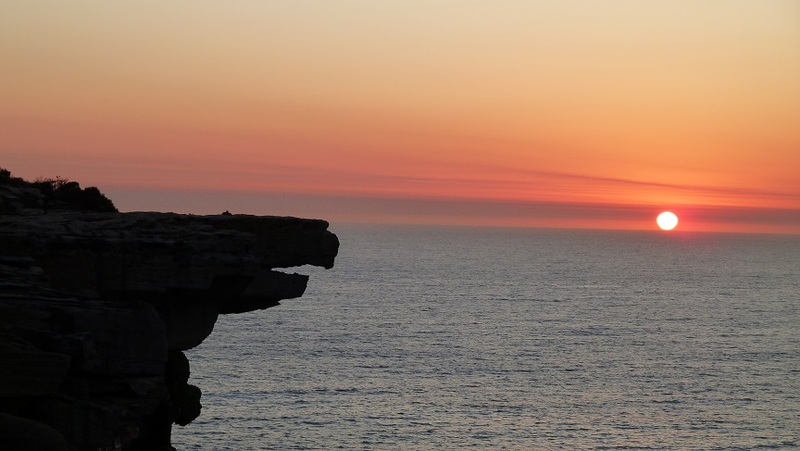 As a case in point, it is not hard to guess what this rock in The Royal National Park south of Sydney is called. The “creative” perception that enables you to see why “Eagle Rock” is so called is known as pareidolia. Interestingly, when we are experiencing pareidolia, the activity in our brain is the same as when shapes and patterns in the form of actual objects are being observed. Because it is wired to detect patterns, our brain does so “fluently” and with minimum effort. Associated with the fluency is pleasure. When our brain is doing something it is meant to do, feel-good chemicals including dopamine are discharged, bringing the emotions of pleasure and reward into play. As a result, we find looking at natural patterns and the shapes they form an attractive and agreeable thing to do. If they are anything, rocks are the repository of patterns – wonderful and varied patterns. That, surely, is why we like them. Look again at Ross’ photos. See the repetition of flowing curves in the first and the repeated angular as well as the flowing lines in the second. And see in both the hint of fractal shapes along the jagged edges of the formations. There is also symmetry to be enjoyed in both, along with the emphatic repetition of cracks and spherical forms. 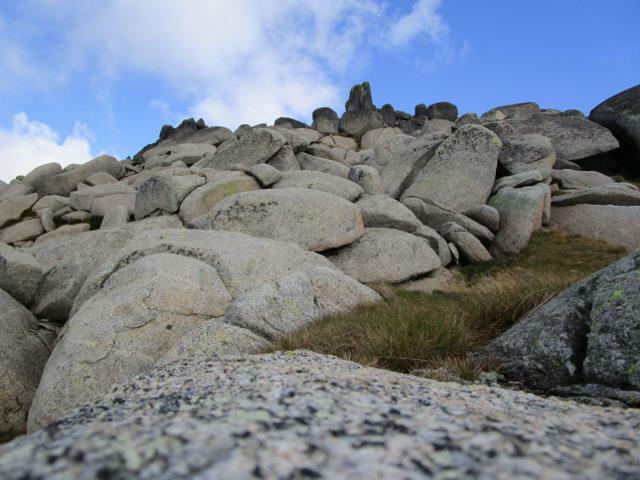 And if we were able to look more closely at the surfaces of Ross’ rocks, we might find more attractive patterns there – formed, for example, by different coloured crystals and chemicals in the rock or by colonising lichens and mosses. 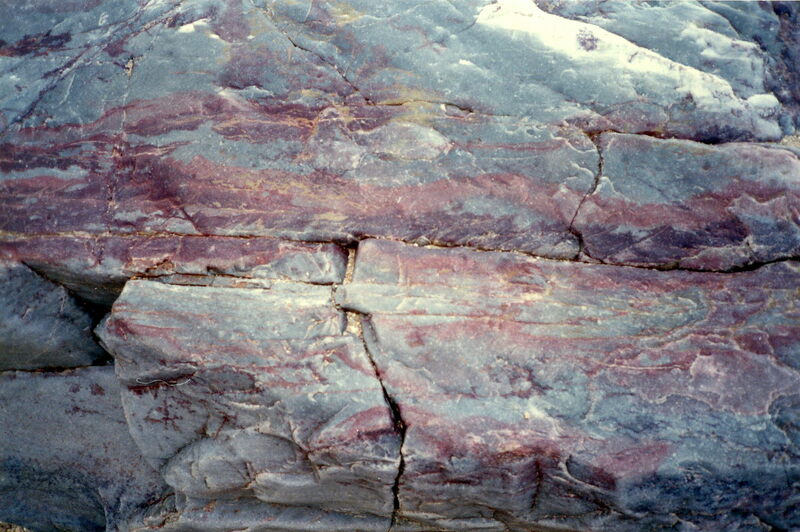 To the question, What is it about rocks?, one answer is clear – aesthetic patterns and shapes. What is it about caves (and other enclosed rocky places)? 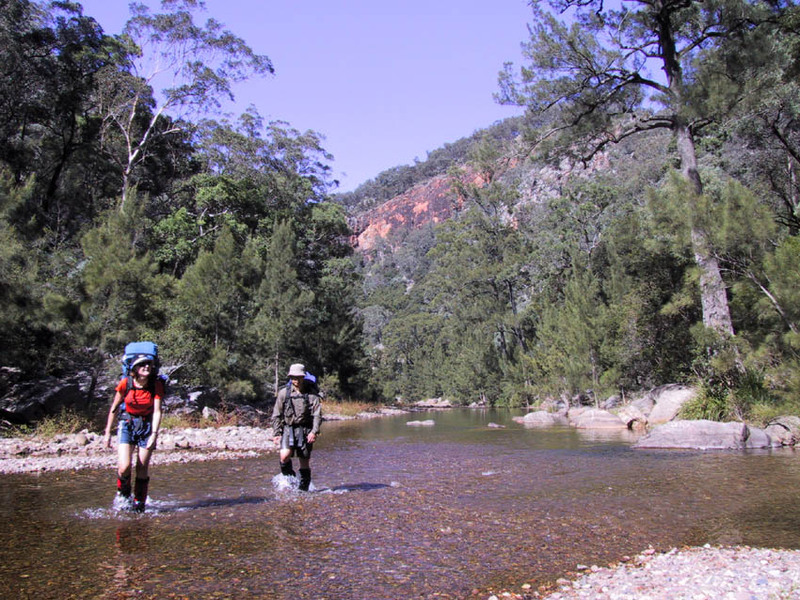 On a field trip surveying gorges in the Northern Flinders ranges of South Australia, consultant archaeologist, Giles Hamm, wandered up a creek bed seeking a private spot for a “comfort stop”. 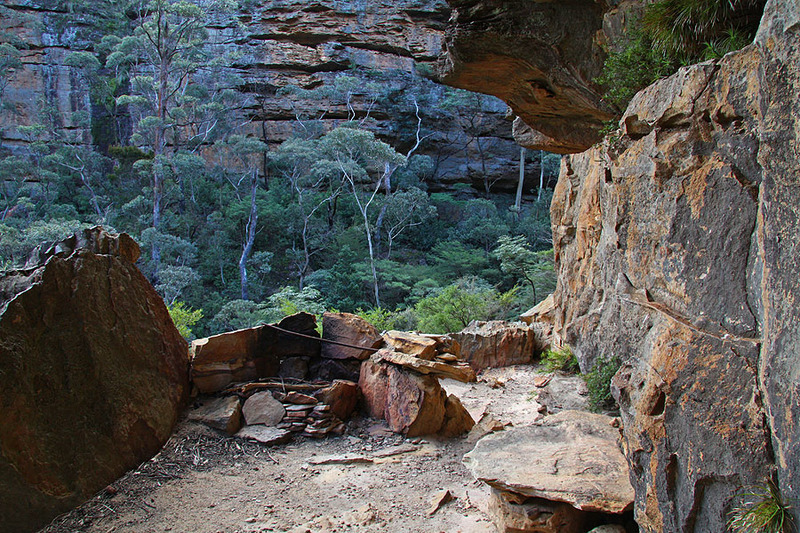 He noticed an “amazing spring” surrounded by rock art and then 20 metres above the creek bed a rock shelter (now with the name of Warratyi Rock Shelter). The smoke-blackened roof of the shelter indicated to him that it had once been used by Aboriginal people. Subsequent investigation of the shelter has produced bone tools and other cultural artefacts from 49,000 years ago. 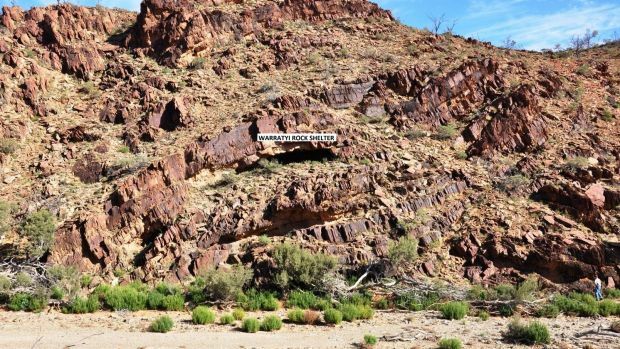 These finds put the Aboriginal presence in the area 10,000 years further back in time than had previously been thought. Even without the evidence of cooking fires, the shelter would have sparked Giles’ professional interest. He would no doubt be aware that rock shelters and caves have been magnets for human beings for almost as long as our species has been around. The Warratyi shelter combines two key features that humans find attractive – prospect, a partially framed view or outlook and refuge, protection from attack (especially from behind) and from the elements. 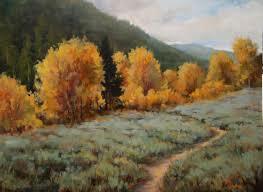 In 1975, the English geographer, Jay Appleton, advanced the theory that prospect and refuge satisfy two desires that shape what we find attractive and interesting in both art and the landscape. The first of these is the desire to know what is present and what is happening in our surrounding environment. The second is the desire for physical security. According to the theory, both desires are inborn legacies of survival needs that shaped the genome of our species. 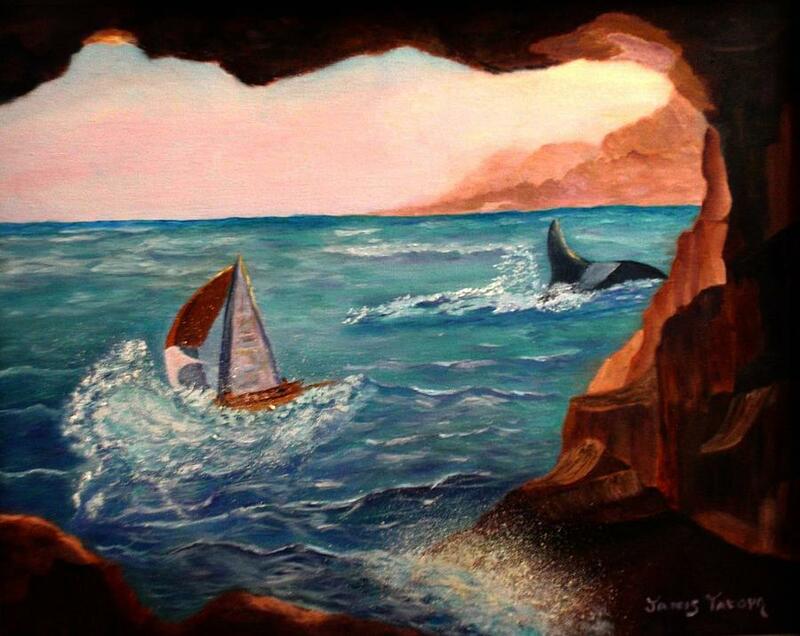 The theory says basically that we humans are attracted to situations and art that present to us vistas and places, such as copses of trees and caves as well as rock shelters, where refuge could be found. The scientific testing of Appleton’s theory is incomplete but it is easy to find “everyday evidence” of the pull of prospect and refuge on our minds, even in infancy and childhood. Witness the delight of children in cubbies and treehouses, for example. And what about the millions of dollars people are prepared to pay to own a house in an elevated position that commands a panoramic view of some kind? Think too of the many tourist meccas whose appeal lies in the spectacular views they offer. Talk to people like me who love walking in nature and you will soon learn that high on our list of favourite places will be vantage points and caves or rock shelters suitable for resting and camping. More enclosed places seem to add further dimensions to the prospect-refuge experience – especially feelings of awe and a sense of mystery. 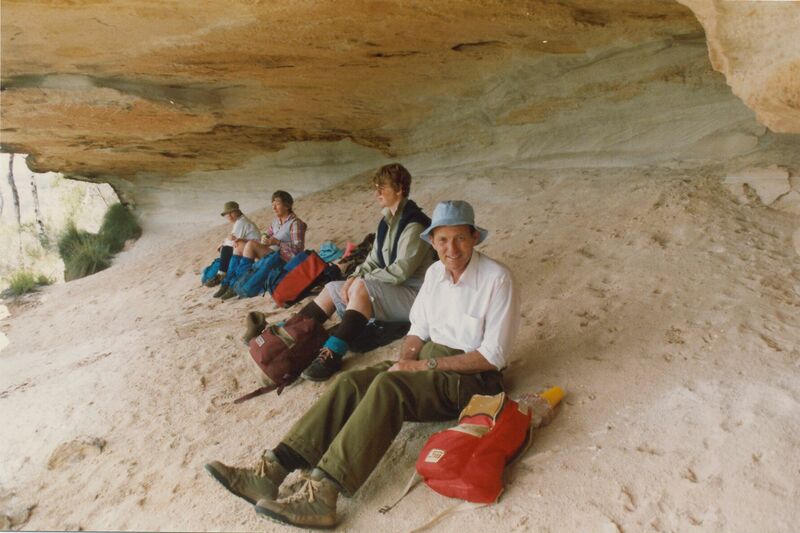 For many years, I took people regularly to Spider Canyon in the Blue Mountains of New South Wales. 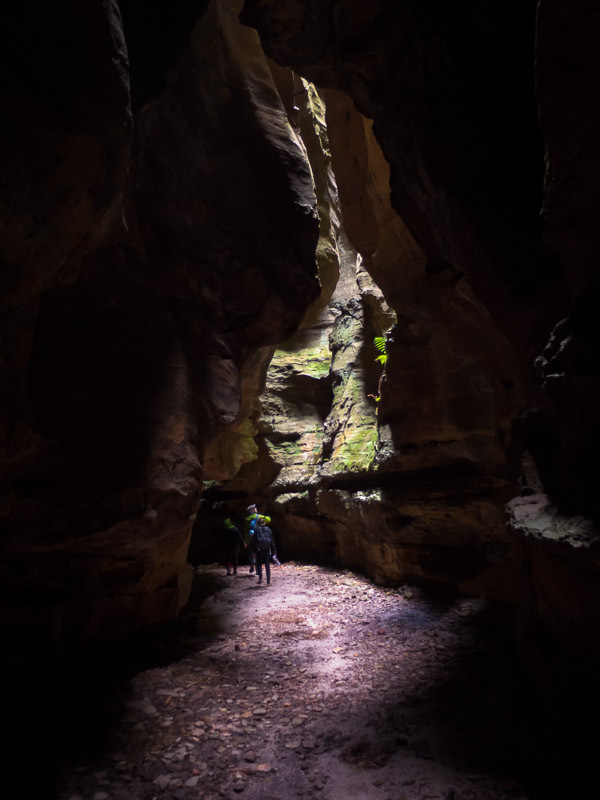 Though short in length, this canyon has several very confined, cave-like stretches that are easily walked through. I always liked to reach the deepest and darkest of these sections moments ahead of the rest of my party just to watch and hear people’s reactions to the place. I expected to hear and see expressions of delight, wonder and excitement, and I was never disappointed. As you can see from the photo, there is an “other world” look about the depths of Spider Canyon, an impression that is much stronger when you are actually in it. It is a place that fosters an understanding of why caves have the power to capture the human imagination, being as they often are places of weirdness, wonder, gloominess, mystery and fear. It is not accidental that dark zones of caves have so often been important sacred or mythological spaces in the ritual, artistic and ideological lives of humans. Traditions of ritual cave use have originated at different times in widely separated geographic areas and may be traced back to the earliest of our ancestors. In my bushwalking, I have visited several caves, mostly of the rock shelter variety, where Aboriginal people have left their mark in the form of hand stencils and animal paintings. I also know of at least three caves where white Australians chose to live for weeks at a time. One was the retreat of Dr Eric Dark and his wife, the renowned author Eleanor Dark. 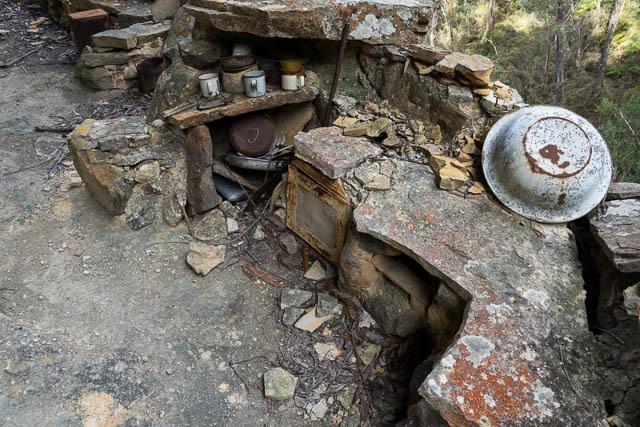 The photos shows the kitchen section of their cave along with utensils, some of which they may have used during their stays there in the 1930s. There is certainly something about caves. I admit that I am not qualified to write about this topic, but my guest blogger, artist Natalie Maras certainly is – and a great deal more besides. 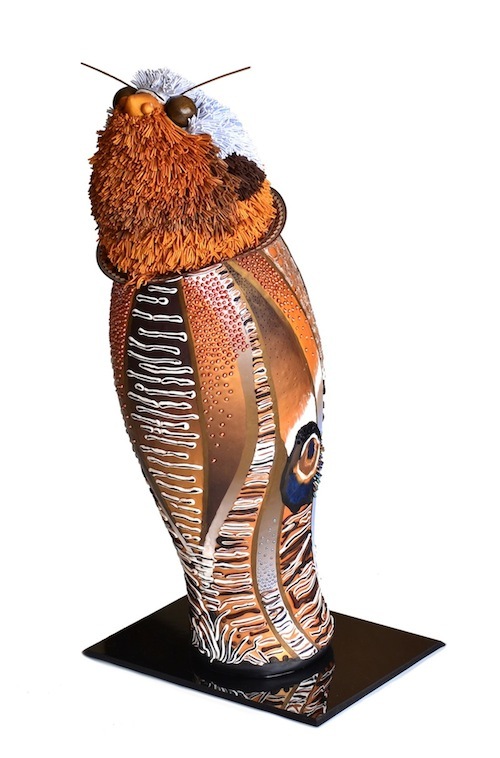 The range of her work as a sculptor is extraordinary but unified by a deep commitment to communicating the essence of her subjects. That essence includes the “patterns of life” that scientists are busily uncovering (and often having difficulty describing to non-scientists) – Natalie has the distinction of being the first ever artist-in-residence at Australia’s prestigious Commonwealth Scientific and Industrial Research Organisation (CSIRO) Herbarium which is part of the National Research Collections. 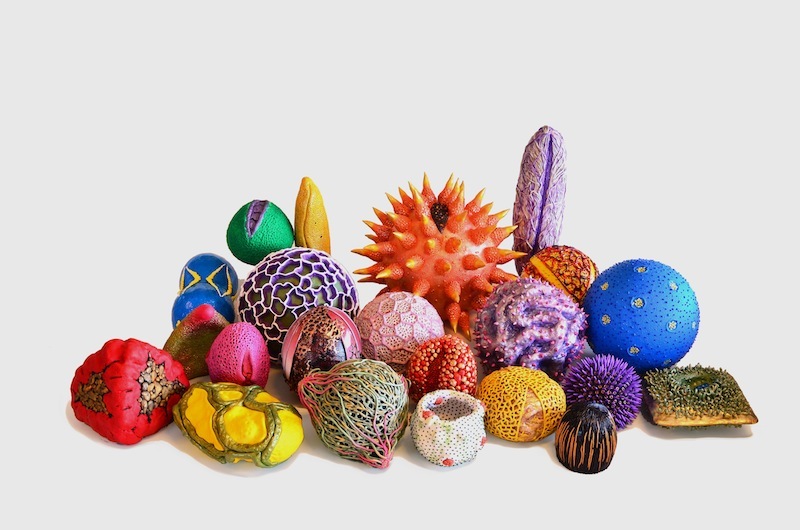 After just an hour or two talking with Natalie and admiring her (sometimes quirky but never frivolous) creations, I knew that readers of my blog would be fascinated to meet her through her own reflections on art and its relationship to the natural world. I was a primary school student sitting cross-legged on the floor in our school assembly. I could hardly contain my excitement at clapping eyes on the man who was addressing us in person from the stage. He had a weathered face, spoke entirely in French, and to my delight he wore his characteristic knitted beanie. To me, he appeared as though he had stepped straight out of the photographs in my favourite books. ‘It’s Jacques Cousteau!’ I whispered hoarsely to my neighbours. ‘Cousteau! Can you believe it – here! You know… deep sea diving, aqualungs, submarines…?’ Their unknowing eyes plunged me into hush. These days, I am in my late thirties, a professional artist and on a daily pilgrimage to the same primary school with my three now young children. I am privileged to demonstrate for them, and for many others with whom I now cross paths as an artist, the importance of doing what you love. ‘Are you an artist because you want to be famous some day?’ the assemblies of primary school children ask me… No. I just love a mysterious thing and like Jacques, I want to spend time with it. I sculpt in love with learning, and I carry the baton of pursuing what I love. I love exploring the underlying patterns of life with my hands and with my imagination. In my studio work, I discovered that the mysterious underlying structures that appear in pollen grains repeat in viruses and bacteria and also vibrate at cosmic level among the stars. The pattern of musical notes when played through sand appears in sacred and primitive architecture as well as in flowers and turtle shells and receding water. The cycles of accretion and erosion in biological soil crusts are identifiable in seeds and in my own bones. Tracing these patterns of nature takes me into ancient time and far into the future, deep underwater, broad around the globe and high into the cosmos and well into myself. I am an artist because I grow in that endeavour, in love. Someone once said of art that nothing great could ever be made by simply copying nature. 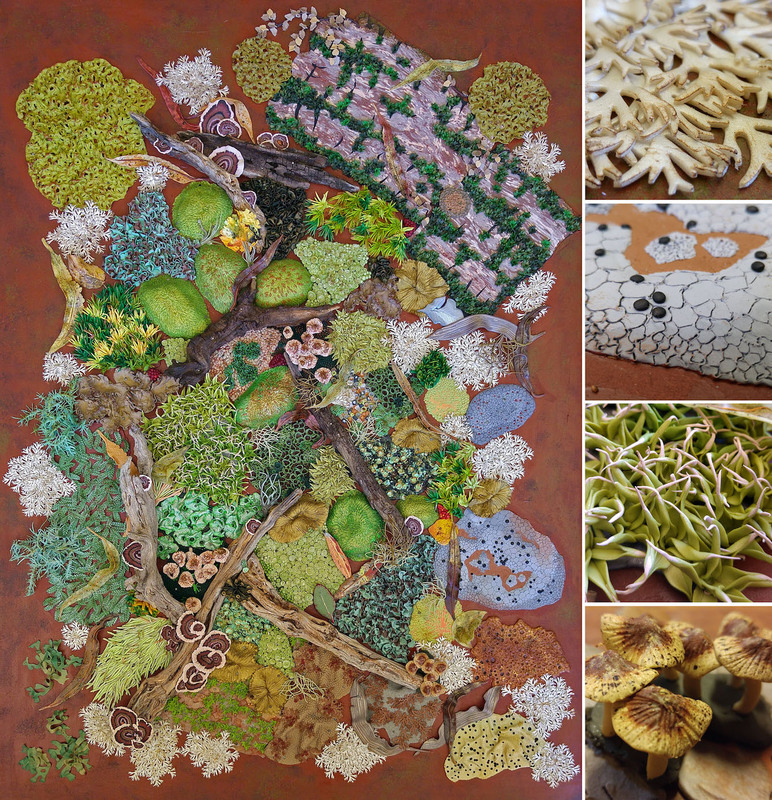 I have been fortunate to meet the works of great technicians of botanical and wildlife art. 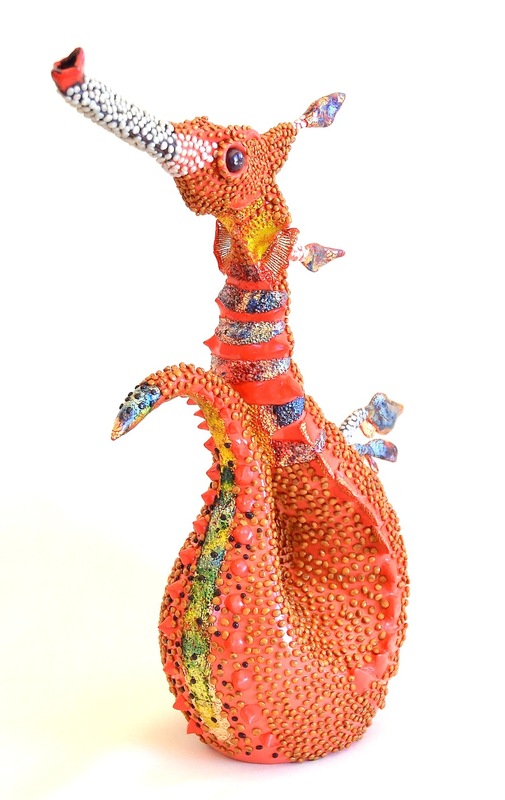 I have exhibited among some of the technicians- at the Royal Botanical Gardens in Sydney and most recently at the South Australian Museum. In museums and galleries around the world I have also encountered the works of many long-passed famous and anonymous artists and craftspeople. I agree now that merely copying nature is not an aspiration held by the world’s greatest artists. The greatest artists aspire to, and do, strike the Source. Though I know there are lesser human copies of nature, which can bring tears to human eyes, to me, human aspiration counts. That aspiration marks human potential and marks the artist. To me if an artist produces copies for a copy’s sake, they are no better than a primitive natural architect – be it moth, ant or termite. After all, a single spider web, dewy in early morning sunlight, will conjure emotion. A single crystalline flake of frost on grass can wondrously steal the words from human lips. Nature presents things of beauty all around us, but this is not art. I also accept that nature often cannot be copied- it sets a standard far too high for humans to reach. That moth, ant or termite actually outdoes the human maker. A humble caterpillar can weave such a cocoon as to put the cleverest human hands to shame. I have in my studio the remnant of a deep-sea sponge, Euplectella, whose spicules of flexible optical fibre defy the most advanced NASA engineering. The Baya Weaver bird has at least a dozen knots in its repertoire to make the most magnificent nests, which cannot easily be replicated. Twice as an artist in residence (at CSIRO) and guest artist (at the ANU) among scientists, I learned first-hand the limits of sophisticated scientific perceptions and technology. universal pattern of life. I say ‘graced’ advisedly. Making art, as I know it, (and caution, dear reader, I have not passed through formal art school!) involves long and careful training in seeing things- from the inside and the outside. It also involves long and careful training with different materials, each with their nuanced behaviour (affinities, hostilities and different states in different conditions). As with our oldest friends, it takes time to know materials and accept their limitations, quite apart from our own. Then there is training to ensure that hands and eyes work together harmoniously allowing space for the artist’s ‘voice’ to enter and more importantly… to exit. Sometimes talent and inspiration arrive spontaneously and ferociously bypass concerted technical efforts. Art can arrive by ‘accident’. By now I understand in my practice that the training I have accepted as my calling is long and arduous and has nothing whatever to do with fame and fortune. I do not seek to copy nature for its own sake. I do not copy nature because I dare to imagine that I am good enough to do this. I copy nature in an effort to refine my perception so that I resonate with influences intended for me. I can accept that I was not intended to understand some aspects of life. Some things will forever remain beyond me. For now, nature sets the best standard to which I can aspire as a sculptor, until grace arrives. Ask any professional garden designer or landscape architect about building garden paths, and I am confident that they will recommend including a curve or two wherever possible. The reason is simple: people usually find a winding path more attractive than a straight one. Straighten this path out in your mind’s eye and compare the two images. Which do you prefer? It is intriguing how the slightly curving stone path with its flanking vegetation makes this potentially dull side-passage into a place of interest and beauty. 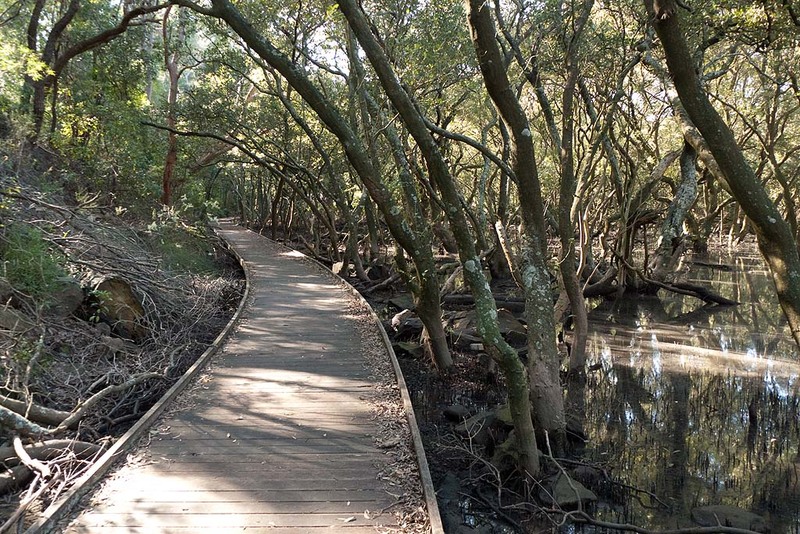 See what the curve does to this boardwalk through mangroves. 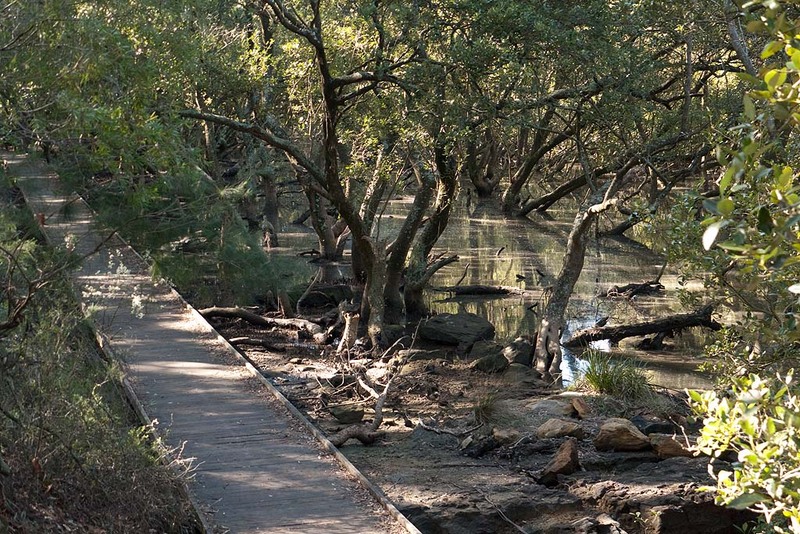 Do you agree that it does a good job of integrating the engineered structure, the boardwalk, into its natural surroundings? You may also sense that the curved section is easier on the eye than the straight or rectilinear one. This is likely to be your experience because human eyes and brains find rounded shapes easier (and more pleasurable) to process. Corners and sharp angles require more effort. In fact, angles can be a turn-off. 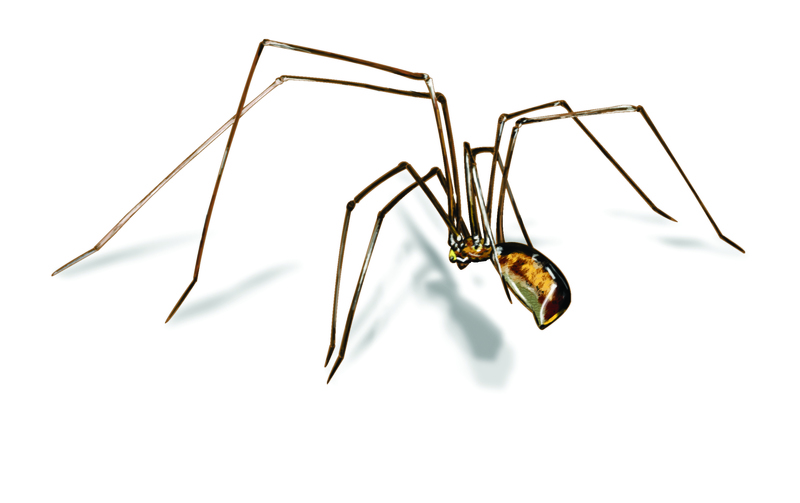 One reason why spiders (even harmless ones) evoke disgust and fear in many people is the angularity of their legs. Other reasons are their generally drab colour and their unpredictable movement. Here is a diagram that nicely illustrates the point about curves. Which of the pathways between the boxes do you find easier to follow – the one with the curves or the one with the angles? Do you find that your eyes are led smoothly on the curved path but not on the angled one? But there is much more to the attractiveness of curved pathways than easy visual processing. If you compare again the two images of the boardwalk, you are likely to feel that the curved one is the more inviting. You can easily imagine that if you were actually on the boardwalk, you would be drawn to follow it round the curve – not simply to take in more of what you can already see, but to engage what you can’t see. The appeal of the curve lies largely in the sense of mystery it creates. As your gaze moves along the curved path, you get a glimpse of a vista beyond, but information about this vista is hidden from us by the bend itself, as well as by the distant trees. Therein lies the element of mystery – the feeling that we could gather new information about the vista and other things by following the path and looking around the bend. To secure this new information, we would have to move from our present vantage point to a new one. We would have to do some exploring in other words. Mystery in a non-threatening form is a prime motivator of exploration, especially when we are out and about in nature. For humans, exploration has been and remains a very important response. It satisfies our basic need to understand our environment – for survival purposes and to satisfy our brains’ insatiable need for the stimulation of novelty and change. A natural or constructed path, especially one that winds or curves, is a common cue for exploration. 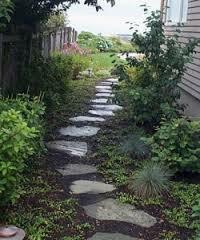 And a path or a riverbank that can be followed into the distance can greatly increase the appeal of a landscape. 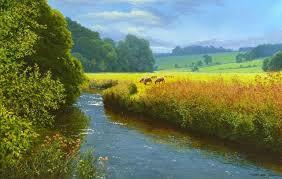 That is why curving paths, rivers and roads are found in landscape art across the world. Their impact is particularly potent if the scene suggests that a fertile valley or cool mountains might be where the path leads. We are usually not conscious of the influence of “curviness” on our feelings, actions, attitudes and even our values. The same is true for angles, flowers and many other features, objects and symbols that make up the fabric of the world we experience. Subconscious influences like these affect our thinking and behaviour in many unexpected ways. You can find many more examples in Adam Alter’s fascinating book, Drunk Tank Pink. Flowers have featured in two recent Australian news stories. Sydney’s Martin Place. 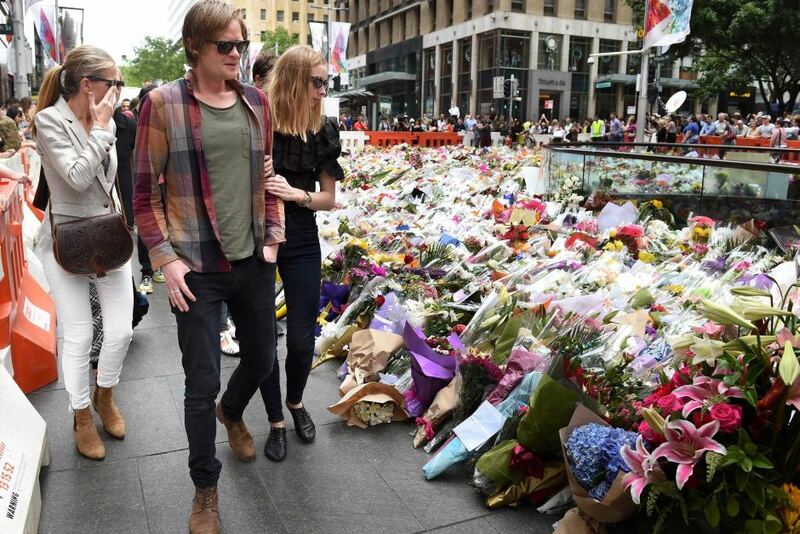 The outpouring of grief, sadness and sympathy across the Sydney community and beyond was deeply affecting. People from a wide range of social, ethnic and religious backgrounds came in their thousands to the place where the drama played out. Some came to convey their sentiments simply with their presence but many brought floral tributes. These were placed informally side by side on the pavement of Martin Place. The display grew rapidly until it became a beautiful and fragrant tableau, reminiscent of the one that Londoners created following the death of Diana, Princess of Wales. The second story is that of a magnificent gesture of sympathy and compassion by journalist, Paul McGeough and his photographer associate, Kate Geraghty. In the face of serious obstacles, not to mention dangers, they harvested sunflower seeds from the field at Rassypnoe where MH17 had plummeted to the ground. Their purpose is to offer the seeds to families of the victims as tokens of remembrance – aptly described as a “simple and elegant gesture”. 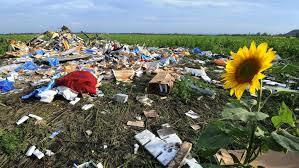 The use of flowers to express grief, sympathy and compassion is not at all surprising. It is a traditional and very widespread custom, just as is giving flowers to express a range of other sentiments such as love, friendship, gratitude, contrition, support, pride and joy. For thousands of years, flowers have served as symbols and tokens of emotions. There are records of the flower-giving in ancient Egyptian hieroglyphics and Chinese writing, as well as in Greek and Roman mythology. In England of the Middle Ages, giving flowers was one way of getting around the prohibition on open displays of affection. By Victorian times a whole language of flowers had evolved, with books being written to help people choose the correct flower for the message they wanted to send, a red rose for “I love you”, for example, or a sweet pea for “Goodbye”, or a white violet for “Let’s take a chance”. But neither the length of the tradition nor the cultural sophistication of flower-giving answers the underlying question, “Why flowers?”. Obviously, their ready availability in most societies makes them a convenient choice, but that still leaves open the question, why choose to use them at all? After all, humans have rich spoken and written languages to draw upon as well as the non-verbal language of gestures and facial expression. I am sure that many a love-struck English couple in the Middle Ages, for example, declared their ardour quite effectively with discreet and private exchanges of meaningful looks. The sheer extent to which flowers figure in human displays of sentiment and in behaviour generally points to a much deeper answer than their mere availability. In fact, this availability itself needs to be explained. Even as open urban land becomes scarcer, domestic and public flower gardens survive and there is no sign that our desire for flowers is diminishing. According to Wikipedia, the global floral industry is currently worth more than $US 100 billion and growing. When you consider the limited practical usefulness and short lifespan of flowers, this figure is astonishing. It is, for me, further clear evidence that our demand for flowers is driven by our emotions much more than our rational minds. How flowers come to be associated in our minds with so many of our emotions is not known for certain. The existence and complexity of the association across human societies, cultures and histories indicate that more than learning is involved. It seems much more likely that our brains have been primed by evolution to respond emotionally to flowers in a way that favours their use in social communication and interaction. The power of flowers to elicit strong feelings and to bring people together has been investigated by Professor Jeannette Haviland-Jones. In the first of her studies she compared the responses of 147 women (aged from 20 to 60+ years) to three different gifts – a mixed-flower bouquet, a basket of fruit and sweets and a candle on a stand. In the second study, 122 people (60 men, 62 women) were observed after they had entered an elevator alone. Once in the elevator, each person was exposed to one of four conditions – receiving the gift of a single Gerber Daisy, observing (but not receiving) a basket of the Gerber Daisies, receiving the gift of an inscribed pen, and receiving no gifts or observing no flowers. 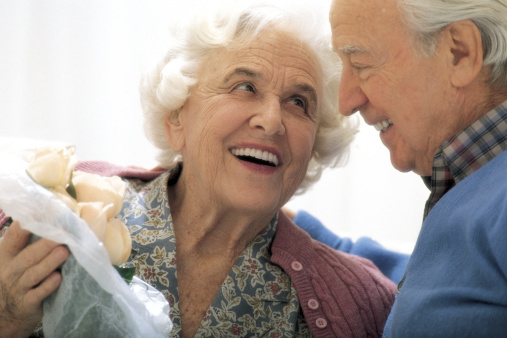 The third study involved “seniors” and involved tracing the effects on mood of receiving flowers (one bouquet for one group of subjects, two for another) at intervals over a one to three weeks period. The behaviour observed in the studies was amazingly consistent from one person to another. In response to flowers, more than to other objects, there was a genuine (Duchenne) smile of happiness; there were feelings of pleasure that could not be attributed to the surprise of receiving a gift, and there was a boost to mood that lasted for as long as several days. It was also evident that flowers helped to reduce social distance and to facilitate conversation. Haviland-Jones suggests that evolution could have worked in two ways to produce our substantial emotional response to flowers. It could have fashioned the response to promote the successful search for food – flowers having strong associations with fruit and seeds. Or there could have been some degree of co-evolution whereby flowers acquired features that increased their attractiveness to humans and thus the likelihood that humans would become willing but unwitting agents in seed dispersal. Whatever the answer to the question, Why flowers?, turns out to be, our relationship with flowers will remain something to value and marvel at. 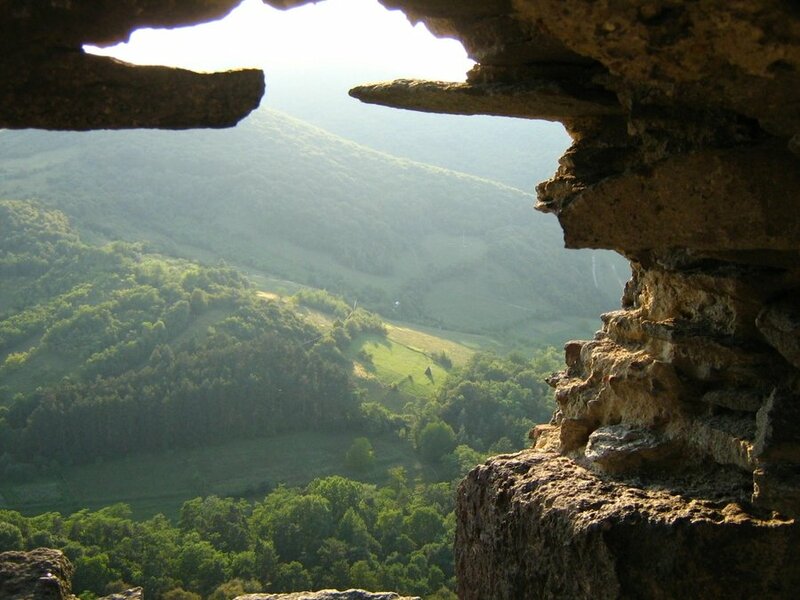 It will always be a window to our wider connection with the natural world and to our inner selves. Tell me, non-believers, where does our appreciation of beauty come from? It is the most basic instinct of all creatures, including mankind, he wrote, to seek the strongest and the fittest, which in turn has evolved over time to be represented by the most beautiful. Beauty enhances survival rates, and it flows into all aspects of our lives to seek beauty, and therefore continuation and strengthening of the species, so our appreciation is little more than evolution at work. No divine intervention there. What we in the West regarded as a beautiful woman 200 years ago (and still is in much of the world) would be thought of as obese today. I must say that I was disappointed, but not surprised, by the dated, simplistic and misguided ideas contained in the body of letters – not surprised because enjoying natural beauty, being one of our commonest pleasures, is easily taken for granted. We expect to encounter beauty in almost all forms of nature, including representations of it in pictures and photographs, and we are rarely disappointed. But there is a great deal that is extraordinary about this ordinary experience. There is much more to natural beauty than meets the eye (ahem!). Our awareness of beauty is one of the most generous and important gifts of biophilia – our inherent bond with the “wildness” in which our species evolved. There is some truth to Julian Brown’s assertion that fashions in feminine beauty change, but this is no basis for saying that everything about the perception of beauty is individualistic. Being a response our brain makes, beauty is indeed “in the eye of the beholder”. The uniqueness of our personalities and life experiences ensures that no two of us will experience beauty in exactly the same way. But this does not mean that everything about beauty and the pleasure it gives is unique to the individual. Our tastes in beauty may differ, but a great deal of what is experienced as beauty in the world is shared. What is beautiful for you or me is likely to be beautiful for others as well. This is particularly so where natural beauty is concerned. 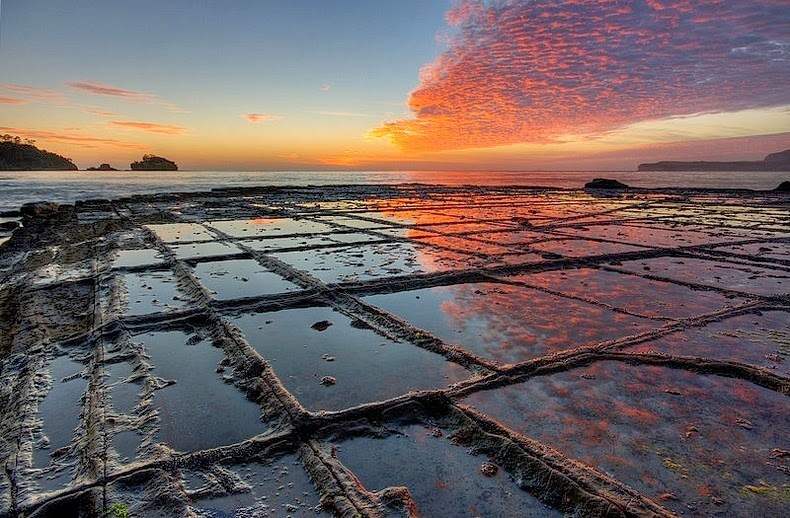 There is plenty of evidence showing that a landscape seen as beautiful by an Australian, for example, will likely be regarded in the same way by someone from the United States of America, Indonesia or Scandinavia. 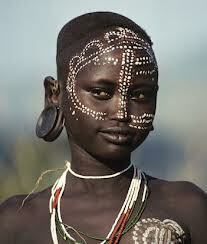 Contrary to what Julian Brown may think, people are more alike than different in judging beauty and ugliness. Stephen Jackson is on firmer ground in arguing that our appreciation of beauty is “evolution at work” – although there is much more to this idea than is conveyed in the phrase, “the survival of the fittest”. But he is mistaken if he thinks that there is nothing more to be said on the matter. There remains as much mystery as there is insight about the pathway by which the ability to experience beauty came to be part of our make-up. Evolution is the interplay of chance genetic change and natural selection (the retention of only those changes that enhance survival and reproduction in the prevailing environment). By its very nature, this is a highly unpredictable process with many possible directions and outcomes. This means that the evolutionary pathway leading to our appreciation of beauty could have diverged at any one of countless points. But against the enormous odds it didn’t. Why it didn’t may be the result of chance, as many scientists would argue. But there are others, including A R Wallace the co-discover with Darwin of the principle of natural selection, John Polkinghorne, priest and former Cambridge professor of plasma physics, and Francis Collins, head of the Human Genome Project, who think that there is more to it. Just what this “more” may be remains a mystery and a matter of speculation. Adding to the wonder and mystery of the beauty response is its bountifulness. Our brains first evolved to associate beauty with those aspects of the natural environment that are directly or potentially beneficial, such as water, fruit and open woodland, and to regard as ugly objects ,like snakes and putrefying carcasses, that could do us harm. But our ability to perceive beauty now serves us in other, unexpected ways as well – sparking curiosity, inspiring creativity, stimulating empathy and so forth. Clearly, beauty impacts on the human mind in ways that range well beyond the sphere of physical survival and reproduction alone. to pursue self-interest, and also colonists (bees) who are adapted to serving the basic interests of the groups we depend on. In other words, we are “groupish” as well as selfish. And, as I explained in my last post, empathy, helpfulness, generosity other prosocial behaviour, is stimulated by natural beauty. 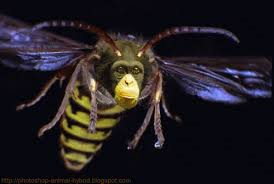 So it is that the amazingly rich beauty response has come to serve both the “bee” in us as well as the “chimp”. The news stories of the last week or so from the Ukraine, Syria, Gaza and elsewhere remind us that nothing in this world is as wantonly divisive, destructive and tragic as unleashed human self-interest. As I tried to come to terms with the horror and obscenity of it all, I drew solace of sorts from an unexpected source – a recent research report in the Journal of Environmental Psychology. Human civilization has had a profound and ancient relationship with the natural world. In this research, we asked the question, does nature help promote the greater good? Our studies reveal that it does. The studies were conducted by five psychologists led by Jai Wei Zhang from the University of California, Berkeley. Zhang and his colleagues were interested specifically in the effects of natural beauty on kindness, empathy and other positive social behaviour (or what psychologists call “prosociality”). 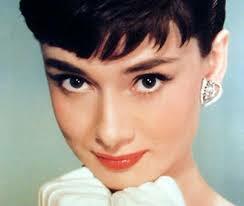 They noted that several contemporary philosophers have positively linked beauty and prosociality. Simone Weil and Elaine Scarry, for example, claim that people experience a “de-centring” of the self when viewing something beautiful. In a similar vein, Iris Murdoch said that beauty leads to what she called “unselfing”, the process of transcending self-interest to become more generous and kind. These views line up very nicely with recent neurological findings indicating that encounters with beauty activate brain regions associated with empathy, openness and other social responses. Zhang and co reasoned that if beauty can shift perspectives away from the self and towards others, then the greater the beauty the more the shift. They undertook their research to test this idea and to determine whether or not any such shift was affected by individual differences in people’s openness to natural beauty. They were able to measure such differences using a questionnaire (the Engagement with Beauty Scale) that discloses how much a person is oriented towards, and aroused by, various forms of beauty, including natural beauty. They were also able to assess the generosity aspect of prosociality using “games” (Dictator and the Trust Game) that measure a person’s willingness to share and to display trust. But not content with paper-and pencil measures of prosociality, the researchers created a scenario that enabled “real-life” kindness and generosity to be observed and assessed (about which there is more below). A major challenge for the researchers was to devise materials that would evoke two broad subjective responses to natural beauty – “more beautiful” and “less beautiful”. 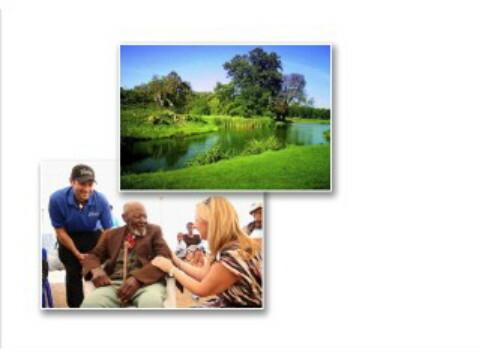 This involved extensive trialling and assessment of images to produce two slide presentations, each of 10 images. The top pictures in the pairs below are examples of the “more beautiful” images and the lower ones the “less beautiful”. The researchers took steps to ensure that the pairs of pictures were comparable in terms of the objective dimensions of beauty such as symmetry, proportion and complexity. For the last of the four studies in their project, the researchers used nursery plants (also selected after an extensive trialling process) rather than images to create the conditions of “more” and “less beautiful”. Participants in this final study were randomly allocated to a room where they were seated in clear view of either an arrangement of the “more beautiful” plants or one made from the “less beautiful”. After they had completed a questionnaire measuring their current level of positive emotion, the participants were asked to volunteer for a simple altruistic task – making origami cranes to be sent as greetings to victims of the 2011 Japanese earthquake and tsunami. The number of cranes folded served as a measure of helping. exposure to more (rather than less) beautiful plants in a laboratory room led people to exhibit increased helping behaviour. 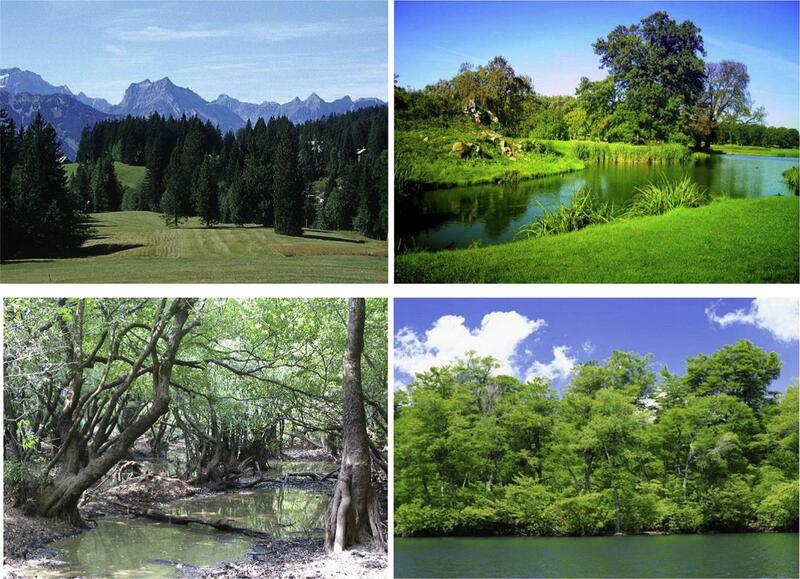 beautiful nature makes people more prosocial by stimulating their feel-good emotions. The take-away message from the report is that natural beauty is a rich source of goodness for the human mind and soul. As Rachel Carson, one of the most influential scientists of the 20th century, said, “Those who contemplate the beauty of the earth find reserves of strength that will endure as long as life lasts”. John Muir, the 19th century pioneer conservationist, naturalist and writer was absolutely right when he declared, “Everybody needs beauty as well as bread, places to play in and pray in where nature may heal and cheer and give strength to the body and soul”.